News now from Frank Grzeszczak at International Yacht Collection that he and his son Frank Jr have signed the new 24.4m motor yacht Emuna for sale. 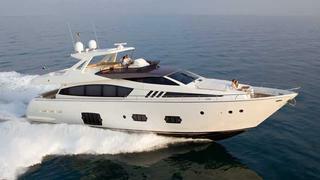 Designed by Studio Zuccon, Emuna is a Ferretti 800 with a 2013 model year. Accommodation is for eight guests in four staterooms including a large master suite and two VIP cabins while her twin MTU 12V 2000 engines have only 19 hours on them. Lying in Aventura, Florida, Emuna is asking $4,995,000.